Isla Fisher in Level 99 Cheetah Jeans Again! Now You See Me actress, Isla Fisher wears Ag Adriano Goldschmied Crop Jeans to take her daughters Olive and Elula Cohen to The Coop for a little play time in Studio City. 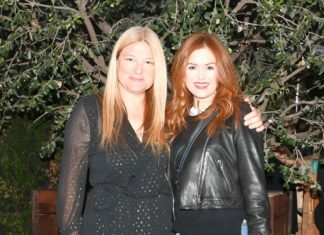 Seen out and about in Los Angeles, actress Isla Fisher woreSanctuary Charmer Skinny Jean in Rust while meeting friends at Terroni's Italian restaurant with her daughter, Olive.